What Causes Black Spots on Watermelons? Watermelons are the dessert crop of the vegetable garden, and the sweet, refreshing fruit matures in the heat of summer, just when we need it most. A few conditions and diseases cause black spots and blotches that make the fruit inedible. Blossom end rot, which is caused by soil conditions, is easily corrected so that the gardener only loses the first ripening fruit, while bacterial and fungal diseases can destroy the entire crop. Watermelons are the sweet delights of the midsummer vegetable garden. Black rot, caused by the fungus Didymella bryoniae, affects members of the cucurbit family including squash and cucumbers, pumpkins and watermelons. The symptoms vary depending on the species. 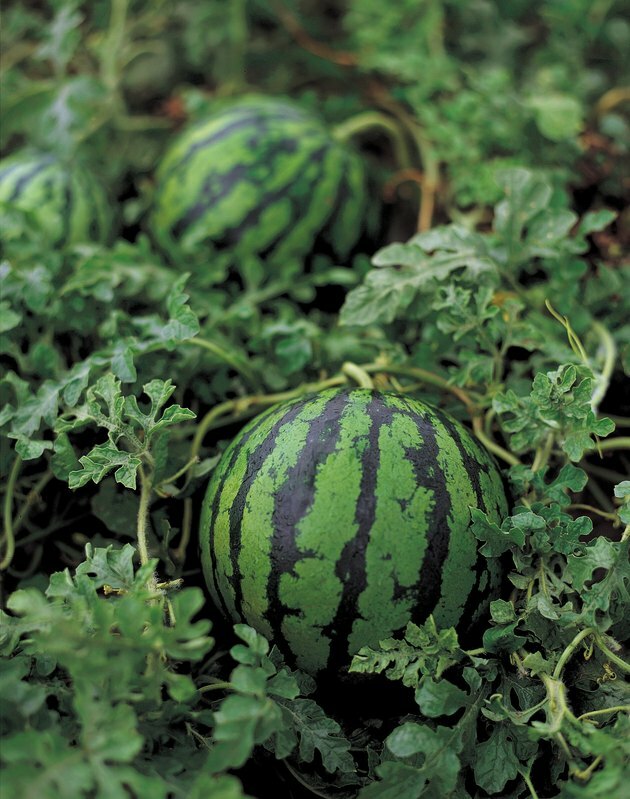 In watermelons, the spots begin as round, water-soaked areas, dark green to black in color. Over time they enlarge and may form a depression in the center with cracks radiating outward. White fungus grows over the lesion when humidity is high. Good cultural practices help prevent black rot. Plant watermelons in well-drained soil and water the plants early in the day so that the vines have time to dry completely before nightfall. Plants weakened by powdery mildew and sucking insects such as cucumber beetles and aphids are highly susceptible to black rot, so control these pests as much as possible. Grow watermelons in a part of the garden where you haven't grown any member of the cucurbit family for the past two or three years. Watermelons with blossom end rot have dark brown or black areas at the blossom end of the fruit. This occurs when the soil is deficient in calcium or the calcium in the soil is in a form that the plant roots can't absorb. Add calcium to the soil in the form of lime or gypsum and spray the foliage with a solution of calcium nitrate or calcium chloride. Remove the affected fruit and avoid excess nitrogen fertilizer, which interferes with the plant's ability to absorb calcium. When the foliage is dark green the plants don't need additional nitrogen. Bacterial fruit blotch is particularly disappointing because the fruit appears healthy until symptoms develop just two weeks or less before harvest time. Symptoms begin as dark spots on watermelons, eventually developing cracks and a scaly appearance. The disease is spread through infected seeds, so the best prevention is to purchase seeds from a reputable source.